Launching in the end of 2015, Silversea Cruise was designed by the industrial ship designing institute and inspected by the local marine registration authority and certified. Silversea Cruise was built to meet seafaring standards. The Vietnamese Marine Authorities certify all materials and equipment used in the construction from the steel, electrical cables and generators. The cruise is fitted with professional marine safety equipment such as WHF radio, GPS plotting, two-way radios, water ingress alarm system, anti-sinking pump system, fire alarm system and fire extinguishers. 12:30: On arrival at pier, you will board your Silversea Cruise and you are warmly welcomed by professional and friendly crew. 13:00: Check-in cabin and enjoy specially prepared lunch while cruising through most beautiful parts of the magical bay with thousands of amazing limestone islands emerging from emerald water. Sailing with Silversea Cruise in very tranquil route, exploring the exotic beauty of the legendary Bay, a feeling in paradise will come to you. 14:30: Keep cruising to the most beautiful parts of Halong Bay. This is the best time to relax after lunch and enjoy your privacy, capturing stunning photos of the legendary bay. 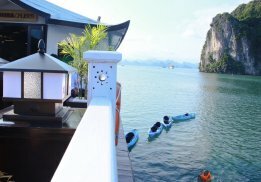 15:30: Small tender brings you to visit Titop island, hiking to the top of the island from where tourists can capture panoramic view of Halong Bay. 18:00: Join the sunset party on the sundeck in warm and romantic atmosphere, making friends with other members in the group, enjoy fresh local fruit, listening soft, light music. 19:00: Enjoy the special dinner cooked by our professional chef. 20:30: The moment you choose your own way to relax after dinner, listening to music, singing karaoke, relaxing on the sundeck, squid fishing available for entertainment during the night time. 06:00: Take photos of sunrise, morning exercise with our Tai Chi master, a perfect healthy way to start a new day. 07:0: Enjoy your breakfast, coffee, tea, fruits. 08:00: Visit Surprising Cave – the most beautiful one in Halong Bay. 09:00: Back to Silversea Cruise for check-out. Keep cruising towards Ha Long Bay, passing by hundreds of islands and islets with different shapes depending on your imagination. 10:00: Cooking class opened right on the cruise. 11:00: Farewell lunch served on the cruise before you arrive at harbor. 12:30: Get back to Hanoi. 16:30: Transfer you back to your hotel. Single Supplement: US$ 50.00/person in Cabin on boat. US$60/ ocean view cabin US$ 90/ Royal Suite cabin. 06:00: Morning exercise with our Tai Chi master, a perfect healthy way to start a new day. 07:00: Enjoy your breakfast, coffee, tea, fruits. 08:15: Transfer to our daily boat, cruising to other parts of Halong Bay, less touristic. 09:30: Get off the boat to discover a beautiful cave named “Fairy Lake cave”, very famous for the beauty, geological and historical values. Tourists can see and take photos of beautiful stalagmites and stalactites and a mysterious lake as well. 10:30: Kayaking, discovering the tranquil bay. 12:00: Back to the daily boat and relax before enjoying lunch on boat. 13:00: Keep cruising to other parts of Halong for an hour more. 14:00: Stop over at a fishing farm, where the local people raise fish and cultivate pearls. 16:00: Back to your sleeping boat to relax and enjoy your private time on boat. 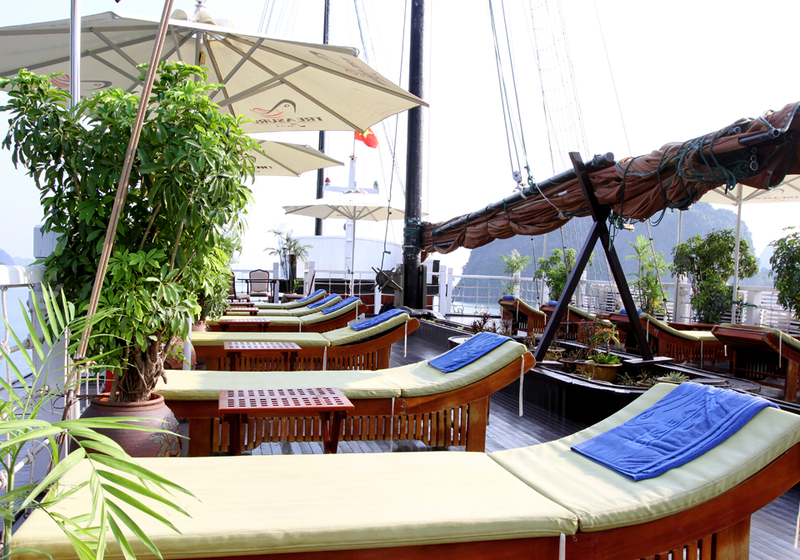 09:30: Transfer to our daily boat, sailing through Lan Ha bay for 2 hours. 11:30: Arrive at bungalow for check in. 12:00: Lunch in the restaurant at the bungalow. Enjoy your private time at leisure, relaxing, sunbathing on the beach or using some services available on the bungalow like playing football, volleyball, badminton, play pool, table tennis, kayaking to explore untouched area nearby bungalow. Optional trip (biking trip to Viet Hai village) must be booked in advance, extra U.S. $5/ person. 18:30: Enjoy the BBQ diner in Bungalow. 20:30: Relax at leisure on your own or joint some activities in Bungalow. 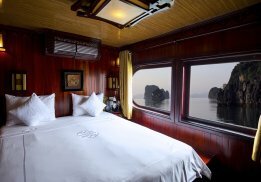 09:00: Back to the Silversea Cruise for check-out, keep cruising towards Ha Long Bay to explore other parts of the huge Bay, passing by hundreds of islands and islets with different shapes depending on your imagination. 11:00: Farewell brunch served on the cruise before you arrive at harbor. Deluxe Cabins with A/C and en-suite Bathrooms.